You can choose to pay your 2018 premium for your professional liability insurance in a lump sum, or by quarterly or monthly instalments. But only lump sum payments, made by cheque or pre-authorized bank account withdrawal qualify you for the $50 per lawyer early payment discount. 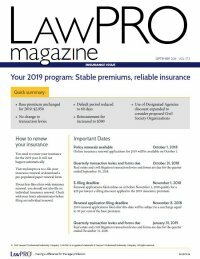 To benefit from the early payment discount ($54 per insured lawyer from the invoiced amount – $50 for the discount and $4 for PST), you must pay the premium indicated on your invoice in full by cheque, dated and received by LAWPRO on or before February 6, 2018. Please note that paying in a lump sum by credit card does NOT qualify for the early payment discount. Please ensure that you remit the total premium amount as indicated on the premium Invoice, and not the amount indicated on the Declarations page, as that amount does not include the claims history levy surcharge (if applicable) or the PST. Your cheque should be made payable to The Law Society of Ontario or the Law Society of Ontario and mailed to LAWPRO at 250 Yonge Street, Suite 3101, P.O. Box 3, Toronto, Ontario M5B 2L7. Please DO NOT include payments for Law Society membership fees in your mail to LAWPRO.